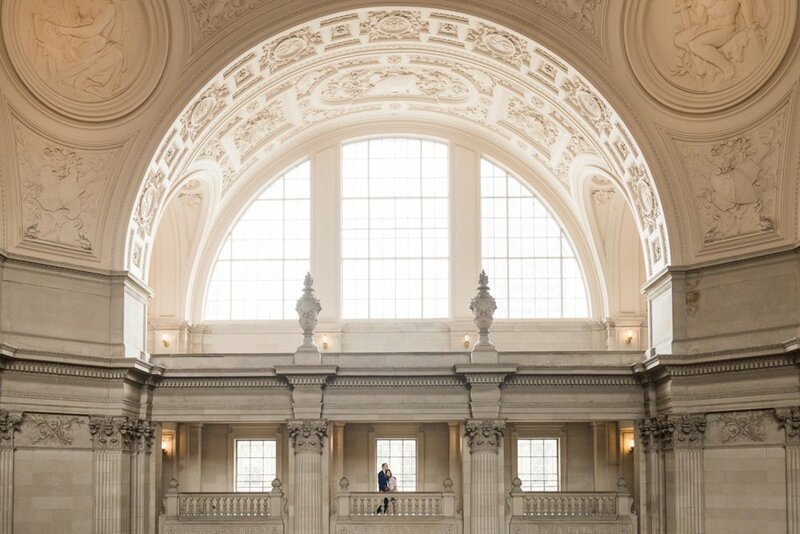 Maria and Graham held their ceremony on the Mayor’s Balcony at San Francisco City Hall and the building’s architecture made quite the backdrop. After the ceremony we took some pictures with family and friends and spent a little more time wandering around before we headed over to Dolores Park for more pictures. Small weddings lend a lot of flexibility and I love when people choose to spend a little extra time taking pictures to commemorate the day. Especially when the location is somewhere they have spent time together–and most people in San Francisco have at least a handful of fond memories from days spent at Dolores Park! Then it was off to their Stable Cafe wedding reception. If you’ve never been to Stable Cafe you should definitely go and have breakfast or lunch there sometime when the weather is nice. They have the most beautiful outdoor space and their food and pastries are great. At the very back they have the cutest area for private events with a wood fire and indoor dining space. Highly recommend! Their delicious dinner was provided by Nopalito–another great place you must try if you haven’t yet!